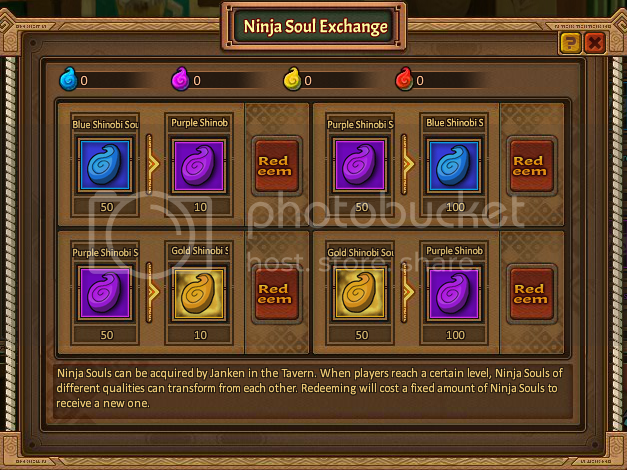 Janken adalah minigame di Naruto Ninja Online yang memungkinkan Anda untuk mendapatkan Souls, dapat ditemukan di Tavern. Janken sama dengan Batu-Kertas-Gunting, itu murni didasarkan pada keberuntungan. Orang-orang telah mengatakan ada strategi tapi itu tidak benar-benar bekerja. Anda harus menekan salah satu tombol seperti yang ditunjukkan pada gambar di bawah. ~ kepalan tangan (batu) - kepalan adalah batu, batu akan selalu mengalahkan gunting tapi kalah sama kertas. ~ telapak tangan (kertas) - Kertas akan selalu mengalahkan batu tapi kalah sama gunting. ~ Win - Sesuai namanya, maka secara otomatis akan memenangkan putaran untuk Anda, jika Anda membayar 50 gold. Jika memenangkan putaran Anda mendapatkan Souls, tergantung di mana tombol janken yang Anda ditekan. Souls adalah mata uang untuk merekrut Ninja yang ada di Tavern. Souls mengacu pada mata uang Tavern yang digunakan untuk merekrut ninja . Ada 4 jenis Souls tetapi hanya 3 yang dapat digunakan . Ini adalah mata uang pertama yang akan diperkenalkan dalam Tavern. Ini tersedia dari level 1 dan digunakan sampai level 70 . Anda dapat memperoleh mata uang ini dari bermain Blue Soul Janken. Blue Souls dapat diperoleh dengan membayar 100k silver, dan bermain mini -game jankenpon ( batu , kertas , gunting ) di Tavern. kalah dalam mini-game dengan 0 menang akan kembali 70k silver. Juga diperoleh dengan sign in pada 7 hari masuk dari hari 1-3 Anda mendapatkan 5 blue Souls di tiap harinya. Purple Souls ( Vip 1 saja) dapat diperoleh dengan membayar 150K Silver, dan bermain mini-game jankenpon ( batu , kertas , gunting ) di Tavern. Kalah dalam mini-game dengan 0 menang Anda mendapatkan kembali 90K Silver. Juga diperoleh dengan sign in pada 7 hari login dari hari 4-6 Anda mendapatkan 5 Purple Souls di tiap harinya. * Perlu untuk memverifikasi : Mereka berada di Tavern lvl 70 juga, dan tersedia untuk non - vip di lvl 70 . Golden Souls dapat diperoleh dengan membayar 300k Silver, via jankenpon ( batu , kertas , gunting ) di lvl 70 Tavern. Kalah dalam mini-game dengan 0 menang akan kembali 180k Silver. juga diperoleh 7 Days login pada hari ke-7. Ini adalah mata uang ke-empat , tidak ada informasi tentang Red Souls . Red Souls Exchange -> Coming Soon! Last edited by Falcon; April 23rd, 2014 at 11:55 AM. Force According to percentage upgrade a certain wrist. Block Upgrade a certain block rate. Chodan Bakugeki Attack Enemy Vanguard, growth coefficient become 70%, and own upgrade 25% block rate, continuously in 3 round. Critical Upgrade a certain crit rate. Spirit According to percentage upgrade a certain spirit. Shosen Jutsu Healing own vanguard, reply coefficient become 100%. Swiftness According to percentage increase certain swift. Hijutsu Attack Enemy Vanguard, growth coefficient 100%, and have probability in controlling other in 1 round. Kage Buyo Attack Enemy Vanguard, growth coefficient 190%, and upgrade own elite 10% damage in 3 round. Hien Attack Enemy Vanguard, growth coefficient 190%, and own upgrade 25% crit rate in 3 round. Nara Clan Naturally has 50% damage rate. Kagenui no Jutsu Attack Enemy Vanguard, growth coefficient 90%, and reduce other 15% defense power in 3 round. Enkaku Chiyu Healing own vanguard, reply coefficient become 120%. Genjutsu Flower Petal Attack Enemy Vanguard, growth coefficient 165%. Strength According to percentage upgrade a certain Strength. Senninka Attack Enemy Vanguard, growth coefficient 70%, and self upgrade 30% block rate in 3 round. Sen'eijashu Attack Enemy Assaulter, growth coefficient 15%. Kakeami Attack Enemy Assaulter, growth coefficient 80%, and have probability in controlling other in 3 round, Control probability affected by the level difference. Kekkai Shiho Fujin Attack Enemy Support, growth coefficient 80%, and have probility in controlling other in 3 round, Control probability affected by the level difference. Dodge Upgrade a certain dodge rate. Hirudora Attack Enemy Vanguard, growth coefficient 90%, and self upgrade 20% dodge rate in 3 round. Sawarabi no Mai Attack Enemy Vanguard, growth coefficient 210%, and self upgrade 20% attack power in 2 round. iaigiri Attack Enemy Assaulter, growth coefficient 135%. Makyo Hyosho Attack Enemy Vanguard, growth coefficient 80%, and upgrade own elite 30 fury, Self upgrade 100 fury. Kagura Shingan Attack Enemy Assaulter, growth coefficient 50%, and have probabilty in controlling other in 3 round, Control probability affected by the level difference. Daburu Kuropansa Attack Enemy Vanguard, growth coefficient 215%, and reduce other 35% dodge rate in 3 round. Kusarigamajutsu Attack Enemy Assaulter, growth coefficient 115%, and self upgrade 50% hit rate in 1 round, recovery 50 fury points. Suikodan no Jutsu Attack All Enemies, growth coefficient 100%, and self upgrade 35% block rate and 15% attack power in 3 round. Iron Arm Upgrade a certain defense power. Futon: Atsugai Attack Enemy Vanguard, growth coefficient 150%, and own upgrade 30% defense power in 3 round. Water Bomb Attack Enemy Vanguard, growth coefficient 220%, and self upgrade 18% attack power in 3 round. Kibaku Nendo Attack Enemy Assaulter, growth coefficient 65%, and decrease 50 point enemy fury, large probability to control other in 3 round, Control probability affected by the level difference. Satetsu Shigure Attack Enemy Support, growth coefficient 60%, and decrease 50 point enemy fury, large probability to control other in 3 round, Control probability affected by the level difference. Swiftness ccording to percentage increase certain swift. Senpo: Muki Tensei Attack Enemy Vanguard, growth coefficient 15%, and self recover 100 fury point, increase 25 fury point. Last edited by Falcon; April 23rd, 2014 at 11:32 AM. Seven Swords Dance Attack Enemy Vanguard, growth coefficient 275%, and reduce enemy 50 fury point. Shiji Hyoketsu Attack Enemy Assaulter, growth coefficient 180%, and reduce enemy 12% attack power in 2 round. Infuin : Kai Attack Enemy Assaulter, growth coefficient 125%, and self recover 100 fury point, Eliminate elite negative effect, elite immunity in 2 round. Yoton : Yokai no Jutsu Attack Enemy Vanguard, growth coefficient 190%, and self recover 100 fury point, Eliminate support negative effect, support probability control in 2 round. Block Increases a certain block rate. Atomic Dismantling Attack Enemy vanguard, growing rate 180%, increase your assaulter's Aid rate by 60% for 2 rounds. Chakra According to percentage increase certain Chakra. Paper Reincarnation Recover all vanguard and assaulter's HP, growing rate 110%, increase caster's Fury by 100 points. Kamui-Explosion Attack all enemies, growing rate 120%, continously decrease enemy's HP by 25% for 3 rounds. Justice Increases a certain Agility by percent, naturally has 5% Avoid-Injury Rate. Hardened Water Drill Attack enemy assaulter, growing rate 130%, decrease enemy's Fury by 50 points. There's a big chance to control the enemy for 3 rounds dealing rate is based on level difference. Senju Clan Increases a certain Force by percent, naturally has 5% Damage Rate. Deep Forest Bloom Attack all enemy, growing rate 130%, recover caster's HP by 50%. Morality Increases a certain Force by percent, naturally has 5% Avoid-Injury Rate. Thunder Axe Attack enemy assaulter, growing rate 135%, recover Fury by 100 points. Force Increases a certain Force by percent. White Zetsu Jutsu Attack enemy Vanguard, growing rate 230%, increase ally assaulter's Aid rate by 60% for 3 rounds, increase caster's own HP by 45%. Iron Gravel Attack enemy Vanguard, growing rate 300%, increase caster's Attack by 20% and Crit by 10% for 3 rounds. Agility Increases a certain Agility by percent. 3 Treasure Suiction Crus Attack enemy Support, growing rate 130%, decrease enemy's Fury by 50 points. There's a big chance to control the enemy for 3 rounds dealing rate is based on level difference. 3 Treasure Suiction Crus Attack all enemies, growth rate 140%, reduce enemy's 30% hp (each round) continuously for 3 rounds.